You are currently browsing articles tagged sea snakes. Annie was right when she said the black-and-gray striped critters I saw popping up on the surface of the ocean all around us were not, technically speaking, snakes. They were indeed sea kraits. (So what’s the difference, right? 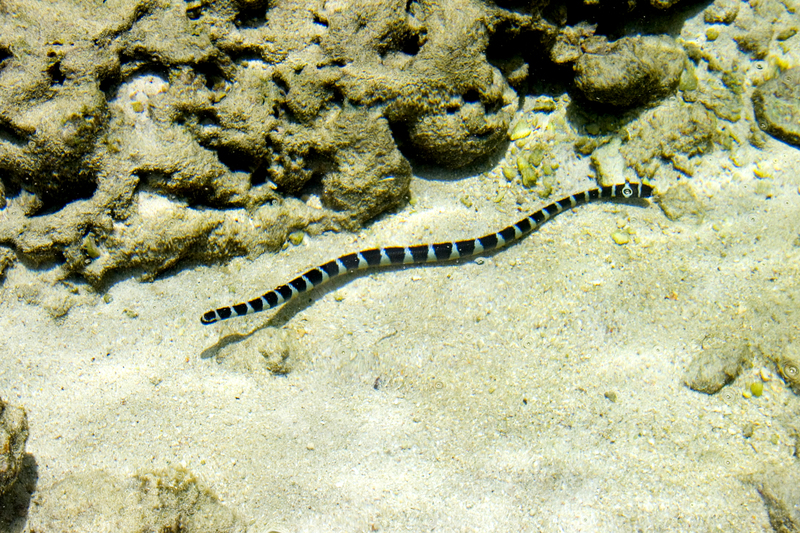 As far as I can figure it, sea kraits like the Niuean katuali return to the land in order to mate and lay their eggs while sea snakes pretty much just stay in the water—but don’t hold me to this.) And it’s also true that while they’re one of the most deadly creatures in the world, they don’t really bother people. Mostly because they have these itty-bitty fangs (if fangs can be itty-bitty) and they’re in the back of their mouth. So basically you’d have to jam a finger down their throat to get bitten. That said, there was still something a little spooky about snorkeling over a cave-riddled and coral-covered lagoon and watching as hundreds of banded sea snakes (I’m going to insist on calling them that) uncurled themselves and, in lazy loops, slithered towards the surface—sometimes just a foot or two away from where I nervously floated—to take a breath of air and have a look around. Then, just as quickly, they’d slither back down to the bottom where they’d curl up with a dozen or so of their pals. I was not tempted to touch one (Annie says their ventral scales, needed for slithering on the shore, feel “creepy”). I was not tempted to stick my fingers in any of the little holes in the rocks where the small coral fish they like to feed on hide. In short, I behaved myself. Which is why I was so surprised, after our successful outing, to get out of the water and step directly on a sea krait. Which did indeed feel creepy. Fortunately, the katuali was very cool about everything. And did not bite. Even as I screamed like a little girl. Which brings us to another Niuean Rule: Just because there are snakes in paradise, that doesn’t mean you will necessarily end up being banished. It’s all up to you. Nonetheless, watch your step. With electricity out on the island again yesterday and the dive center’s back-up generator kaput, it was easy to see why Annie was so thoroughly frustrated. 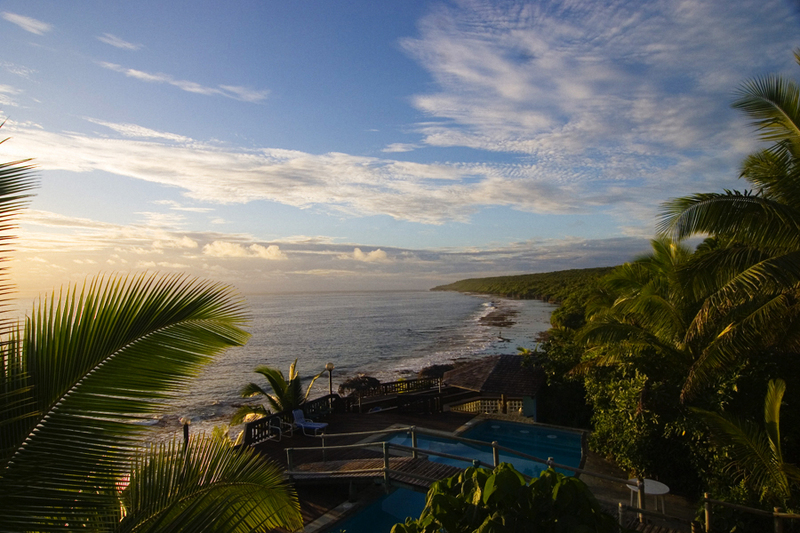 Without electricity, it would be impossible to fill the tanks for this morning’s scheduled dive. Leaving four divers, myself included, with little choice but to cancel the outing and tramp back through the jungle to our hotel, the Matavai, where we’d laze away another day around the fresh-water pool drinking beers and hoping to spot one of the pods of spinner dolphins that usually spent their mornings in the cove below us. But Annie, anxious not to lose paying customers, had something else in mind. Hmmmm….You know what? I love diving and hanging with Nemo and the parrot fish and other denizens of the deep, but I’m not crazy about snakes. Particularly snakes in the water. Did I really want to go swim with a creature whose venom, they say, is ten times stronger than that of a rattlesnake? Not so much. “What’s the difference?” I asked her. Thus, I shrugged and told Annie, What the heck. I reckoned I’d go snorkelling in Snake Gulley.